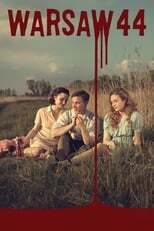 The story is based in 1944, in the middle of Warsaw uprising; the beautiful spirit of love and friendship is tested against the daunting backdrop of violence and inhumanity. Miasto 44 is directed by Jan Komasa and was released on Sep 19th, 2014. Director Jan Komasa's Drama & Romance movie Miasto 44 is produced by Alvernia Studios & Akson Studio & was released 2014-09-19.